This book provides pre- and in-service teachers with information on the ability of schools to include and treat students with speech, language, and hearing problems, and the role the teacher should play in this process. The newest edition of Speech, Language, and Hearing Disorders provides information regarding speech, language, and hearing disorders that is essential knowledge for both future and in-service teachers. 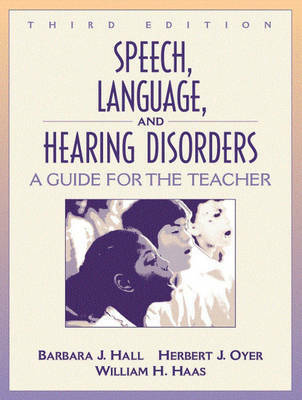 This text provides answers to the questions classroom teachers ask most often, presented as practical information for meeting the special educational and emotional needs of children with speech, language, or hearing problems while promoting the speech and language development of all children in the classroom. Various disabilities are explained, as are some of their assessments, treatments, and practical information for the classroom teacher. Disorders such as articulation and phonological disorders, language disabilities, stuttering, voice disorders, and hearing loss are presented. Special conditions such as head injuries, autism, and Down Syndrome which have speech, language, and hearing concerns are also discussed. This book covers not only the disorders, but also the federal laws that support the rehabilitative work done for these children.